When traveling I have the habit of picking up Scientific American, a popular science magazine published by Nature Publishing Group. While casually browsing the first few pages of the February issue, I suddenly froze on page 5. 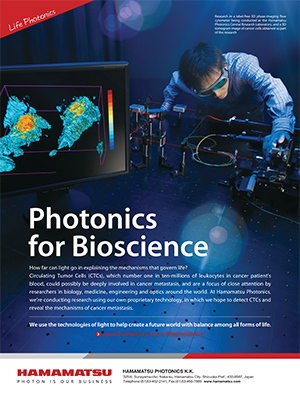 On this page, Hamamatsu Photonics has a full page ad presenting their holographic phase imaging research. I did not freeze because Hamamatsu is a latent threat to PHI. Hamamatsu is currently not a threat as Hamamatsu almost exclusively supplies optical components. I froze because the ad clearly shows that the leading optics company in the world is taking holographic microscopy very seriously and sees its potential as vividly as we at PHI do. Our increasing sales in combination with independent technology promotion are clear signals that a broad acceptance of holographic microscopy technology is rapidly approaching. To address this increase in market demand, an up-graded version of HoloMonitor M4 will soon be launched, in response to customer requests. As a precursor to the forthcoming HoloMonitor M5, the new HoloMonitor M4.5 increases production efficiency, reduces production cost and simplifies installation. To make it possible to record movies of thousands of cells in several cell cultures in parallel, the new instrument can be equipped with a newly developed high-precision motorized stage and image stitching software. This new functionality makes HoloMonitor M4.5 dramatically more versatile, which justifies the higher customer price of €30 000. Several pre-orders of HoloMonitor M4.5 have been received, confirming market demand and price acceptance. A second batch of HoloMonitor M4.5 units is in production. These units are expected to be ready for customer deliveries in April. To accelerate market acceptance and secure future growth, a significant portion of the units have been reserved for the expanding marketing activities which include the strategic partnerships that are in the process of being established. Ad in Scientific American and in Nature. See the upper right caption. Label-free phase imaging implies that unstained cells are imaged as imaged by HoloMonitor.